Bring your family, friends, lawn chairs / blanket and enjoy a picnic on the lawn of Berea Community School as hot air balloons light up the sky. Live Music! Food Trucks! This is just part of a weekend of fun at the Annual Spoonbread Festival in Berea. NOTE: Balloon events are always subject to weather conditions. At the close of the first day of the festival, the hot air balloons will light up the sky with beautiful colors. Bring the family and lawn chairs and admire this amazing sight that will take your breath away. The Balloon Glow is a sponsored event which allows us to provided it FREE to the public. Please support and thank the sponsors. Berea Community School Parking lot and all grassy areas around the school lawn. Food vendors will be parking around the outside of the school lawn. The Jeff Richey Experience will provide live music from 6:00 – 8:00 PM. If you plan on visiting the Hot Air Balloon Glow and will be traveling I-75, we encourage you to use Exit 76 if coming from the South and Exit 77 if coming from the North. Please follow the signs. Parking will be available at 353 Walnut Meadow Rd and 1 Pirate Pkwy. Parking is free but will fill up fast. Please come early. 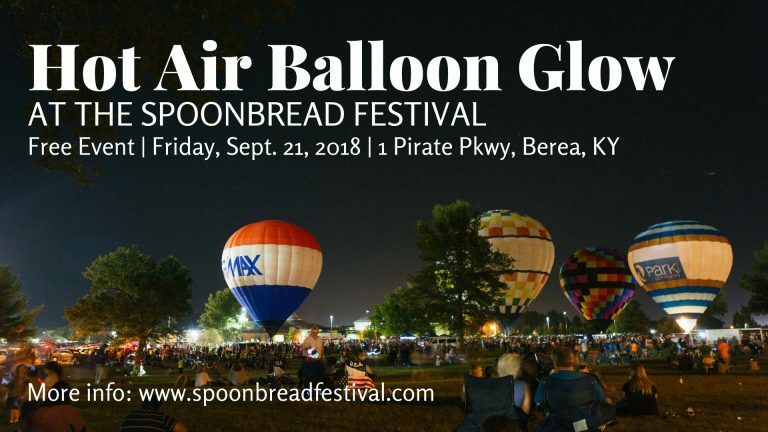 The Balloon Glow is only a short walk from the parking location on Walnut Meadow Rd, but we will be providing a free shuttle service for those that can’t walk the short distance. The main part of the festival is just a short walk from the parking lot at 1 Pirate Pkwy. If your choose to walk, the path to the festival is paved and an easy walk. However if your prefer, a free shuttle will be running throughout the weekend to the festival grounds. Is this free? YES. This is a free event thanks to our sponsors. Is parking free? YES. You will need to arrive early as parking spots go fast. How long does the event last? The time listed on this event is an estimate and the event lasts as long as balloon owners have fuel to light balloons and are willing. If you wish to view the balloons, it is highly encouraged you arrive early. Is this event wheelchair accessible? Handicap parking is limited and attendees are highly encouraged to arrive early. There are paved areas and accessible sidewalks around the perimeter of the lawn. Can I ride in the hot air balloons? There is a FREE tethered balloon ride event on SATURDAY morning 9/22 at 7:30 a.m. You must sign a waiver, children must have a parent or guardian sign. Lines form fast and attendees are highly encouraged to arrive early. TETHERED RIDES ARE WEATHER PERMITTING. THE SLIGHTEST WIND CAN MAKE RIDES UNSAFE AND WILL CAUSE THE EVENT TO BE CANCELLED. Please be understanding of the nature of the event.